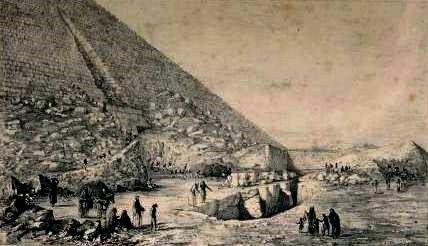 This image of the north face of the Pyramid of Menkaure was made in 1842, only five years after Colonel Vyse's explorations. It shows the damage caused in 1196 by Saladin's son, Malek Abd al-Aziz Othman ben Yusuf, whose attempt to dismantle the pyramid created the gouge you can see above the modern entranceway and stripped away much of the façade. Vyse added to the damage by using gunpowder to blow his way through to the burial chamber. The present-day action in my novel Pharaoh opens with Jack Howard and his IMU team diving deep into the Mediterranean in search of a 19th century shipwreck thought to contain a fabled sarcophagus from ancient Egypt. Their search is based on fact: the ship was the Beatrice, a British merchantman lost in 1838, and the sarcophagus was the stone coffin of Menkaure, pharaoh of the 4th Dynasty of the Old Kingdom who died about 2500 BC. 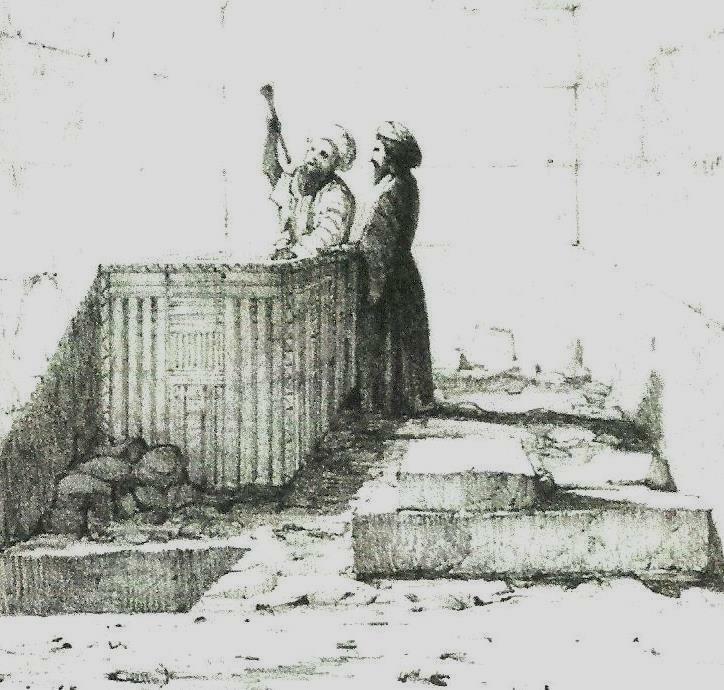 Only months before the wrecking the sarcophagus had been found in the Pyramid of Menkaure - the smaller of the three pyramids at Giza – by a British adventurer, Colonel Howard Vyse, whose account of the discovery, Operations carried out at the Pyramids of Gizeh in 1837, can be read here. The sarcophagus was empty and had been damaged by graffiti, but it’s hard to take seriously his claim that he was rescuing it from ‘destruction’ when he made the extraordinary – some might say appalling – decision to remove it and ship it to the British Museum. With difficulties ‘not trifling’, his assistant and their Egyptian team inched the three-ton sarcophagus out of the chamber and up the entrance passageway, using rollers, a ‘crab’ and sheer manpower, damaging it on the way; at last it reached the open air, and after what must have been an equally arduous hundred-mile trek it was finally embarked at Alexandria on the Mediterranean coast in the autumn of 1838, never to be seen again. This and the other illustration below from Colonel Vyse’s book are the only known record of the sarcophagus of Menkaure. Although seemingly austere by comparison with later Egyptian sarcophagi, it is of great importance for its age - almost 1200 years older, for example, than the sarcophagi of Tutankhamun - and as one of the best exemplars of the architectural style of decoration prevalent in the Old Kingdom. The Beatrice is perhaps the most beguiling unresolved case of a shipwreck containing a treasure much older than the date of the sinking. Some of the most spectacular underwater discoveries have been artefacts much older than the ships that were transporting them, whether smaller items being carried privately as treasured heirlooms or the wholesale shipment of looted works of art and antiquities. While I was an Adjunct Professor of the Institute of Nautical Archaeology in Turkey I was fortunate to handle material in the Bodrum Museum under conservation from the Bronze Age Uluburun wreck, including a decorative stone sceptre-mace, seen here, that has is closest parallel in a bronze mace from Romania – far from the East Mediterranean and Aegean origin of much of the assemblage – and may have been considerably older than the wreck, perhaps the first clear example of an heirloom or ‘antiquity’ being transported by sea. Over a thousand years later, and fifteen hunded miles to the west, the Riace bronzes - found off the southern Italian town of that name in 1972 – were part of a huge traffic in works of art looted by the Romans after their conquest of Greece, some of them dating back to the classical period and destined to adorn the public places and private houses of their new Roman owners. Another great phase of looting took place in the 18th and 19th centuries when the ‘Grand Tourists’ shipped off many of the artefacts that populate European museums today, ranging in size up to entire temple façades. Like their Roman antecedents the ships they used were sailing vessels and therefore similarly vulnerable to wrecking. The best-known example, discovered by divers, was HMS Colossus, wrecked in 1798 in the Scilly Isles off south-west England while she was transporting Sir William Hamilton’s priceless collection of Greek vases from Naples to London. The thousands of fragments now in the British Museum represent a triumph of underwater salvage, but they are also testament to the avariciousness of an age when collectors were willing to risk loss and destruction of antiquities on this scale. A huge timber raft on the Ottawa river below the Canadian Houses of Parliament in the 1890s, the same source of Canadian timber that had been used to build the Beatrice at Quebec some sixty years earlier. The whereabouts of the Beatrice has bedevilled archaeologists for decades. The only solid clues come from the account of Vyse himself, who in that same footnote – with no word of regret – states that the ship had left Leghorn (Livorno in north-west Italy), presumably a port-of-call on the way home, and then was ‘supposed to have been lost off Carthagena’ in south-west Spain, as ‘some parts of the wreck were picked up near the former port.’ In order to build up my own picture of the ship I researched her in Lloyd’s Register, often the only source of details on British merchant vessels of this period. There are several vessels named Beatrice in this timeframe, but the most likely, whose owner and master was a man named Wichelo, was a brig of some 224 tons built in 1827 which had been involved in the transatlantic trade with general cargo between Quebec and England in the early 1830s, as well as in the Mediterranean; at the time of her loss she had been classified as ‘second description of the first class, well and sufficiently found,’ having earlier been modified to snow-rig, been copper-sheathed on two occasions and having had iron instead of wooden knees to hold up her deck timbers. I was fascinated to discover that she had been built in Quebec - a serendipitous connection with another aspect of my research for Pharaoh that I touched on in my previous blog, about the background of the Iroquoian Mohawks on the 1885 Nile expedition, as boatmen who had guided the log booms down the Ottawa river from the northern forests of Ontario to the port and yards of Quebec, where the timber was used for shipbuilding. This level of detail allowed me to picture in the novel how the wreck might be discovered – having found out that she had iron knees, and guessing that she still would have been armed with cannon at this period, not long after Barbary piracy had been suppressed, Jack and his team are able to use magnetometers in their search. It also helped me to understand how the wreck might have occurred. Although she was rated as seaworthy enough and Wichelo had been her master for several years, she was not a specialised stone-carrier like the ancient Roman lithegoi, nor is there any evidence that she had been used for a similar purpose before. Inexpert lading of the sarcophagus could have greatly affected her sailing characteristics. It’s possible to imagine how, being blown suddenly towards shore on a southwesterly coastal route from Livorno towards Gibraltar, Wichelo could have ordered her crew to to change course south with the wind to larboard, a manoeuvre that might normally have saved the day but with the ship heeling over could have caused the sarcophagus to shift, making recovery impossible. Instead of being driven against the shore, she could have swamped in deep water close to the coast – off Cartagena the rocky shoreline drops off quickly to abyssal depth – leaving only flotsam to wash ashore, and thwarting all attempts in modern times to discover her in depths accessible to compressed-air divers. What is certain is that somewhere in the west Mediterranean one of the greatest lost treasures of ancient Egypt remains to be discovered. Being of basalt the sarcophagus may be in an excellent state of preservation, less vulnerable to seawater degradation than limestone. If the sarcophagus of Menkaure were ever to be found, I know where I’d like to see it go – back inside the pyramid at Giza where it belongs. This watercolour, entitled Beatrice of Dundee in Smyrna Bay, September 17th, 1832, is variously attributed to the Marseilles marine artist Mathieu-Antoine Roux (1799-1872) or the Turkish watercolourist Raffaele Corsini. Despite also being a brig and being present in the Mediterranean in the right decade – Smyrna is modern Izmir in Turkey – it seems likely that this vessel is another Beatrice, recorded elsewhere as trading out of Dundee and like the other Beatrice also being involved in transatlantic traffic, taking passengers to New York in 1830. The Beatrice of Dundee was smaller, recorded at 174 tons, but this picture gives a good impression of how the larger Beatrice might have looked, with the same basic rigging and the line of gunports.